To respond to these new technological requirements, Phileo has developed the new generation Actisaf® Sc 47 HR+, providing excellent resistance to the main physical stress factors encountered by yeast probiotics during the pelleting process: compression & friction; heat and humidity. Compatibility with acids in the feed formula comes as the 4th constraint taken into consideration in this multifactorial approach. 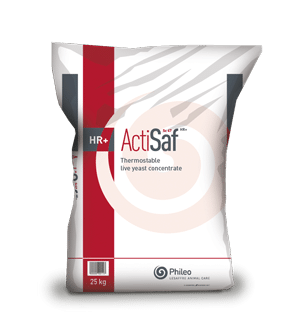 Actisaf® Sc 47 HR+ is a concentrate of live yeast Saccharomyces cerevisiae processed in a micro spherule form (Lesaffre proprietary strain: NCYC Sc 47 / CNCM I-4407). It is the reference yeast probiotic for most farm animal species with European registration in 13 different species and stages including ruminants, swine, horses, etc... Actisaf® improves fibre digestion, improves and stabilizes microflora balance for better performance and delivers better quality end products. From animal health to food safety, Actisaf® is an innovative solution for all participants in the food chain, such as veterinarians, nutritionists, feed millers, farmers and consumers. The new generation Actisaf® Sc 47 HR+ yeast probiotic is the result from an advanced process development, explained Anne Desmons, Phileo Product Manager during the launch at Eurotier. Feed producers are facing new challenges due to technical requirements, such as the use of higher heat treatments or cost optimization issues: the new generation Actisaf® Sc 47 HR+ is equipped to meet extreme feed processing challenges while also delivering better profits on animal health and performance for the feed industry. This is due to Actisaf® Sc 47 HR+ staying alive and being more resistant to modern pelleting processes. First reactions on the launch has been very positive and I am looking forward to the roll out in the coming weeks, continues Anne Desmons. The new Feed tech Service is a complementary initiative to better support feed manufacturers’ specific needs. The new service will be offering the three main pillars of technical assistance, information sharing and in-depth training to better serve Phileo's customers. Offering technical feed service to customers is close to our heart, says Dr. Cecile Sampsonis, R&D Products Formulation Manager, Phileo has always been close to its customers, trying to help them overcome new and emerging challenges. Phileo’s knowledge has increased over the past ten years, enabling us to now give customers a clearer view of the resistance of probiotics to the multifactorial challenges which occur in feed during pelleting. Meta data analysis of more than 2000 feed samples, carried out annually, is the basis for Phileo’s newly developed numerical platform. This platform combines existing Phileo expertise in many fields, with the target of sharing findings with customers to help them develop their activities and address technical issues.